In the fall of 1965, after 18 months of military service in the German Bundeswehr, Deisenhofer began to study physics at the Technische Universität München. During his time at the TUM, his interest slowly shifted to solid-state physics. Together with a couple of colleagues he started his Diplomarbeit in this field in the laboratory of Klaus Dransfeld. The experimental work he performed under the supervision of Karl-Friedrich Renk in Dransfeld's laboratory was very successful, and led to a publication in Physical Review Letters in 1971. 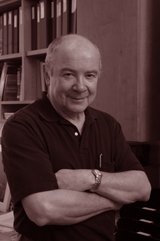 Klaus Dransfeld transmitted his interest in biophysical problems to many students. This had direct consequences for Deisenhofer's career, leading him to undertake PhD studies with Robert Huber who had established a new group at the Max-Planck-Institut für Eiweiss- und Lederforschung. In 1972, the institute moved a few kilometres from Munich to Martinsried, and became the "Max-Planck-Institut für Biochemie". The work he did with another of Huber's PhD students, Wolfgang Steigemann, on the crystallographic refinement of the structure of bovine pancreatic trypsin inhibitor led to a paper in Acta Crystallographica in 1975. Deisenhofer remained in Huber's laboratory for post-doctoral work, taking up a permanent position in 1976. He joined Peter M. Colman, then a postdoctoral fellow in Huber's lab, and Walter Palm from the University of Graz, Austria, in their work on the human myeloma protein Kol. After the solution of this interesting structure, he continued, together with Robert Huber, Peter Colman's work on the human Fc-fragment, and its complex with an Fc-binding fragment from protein A from Staphylococcus aureus. The refinement of these structures was finished in 1980. In the following two years he worked on several projects in Robert Huber's lab: human C3a, citrate synthase and alpha-1-proteinase inhibitor. In 1982, Hartmut Michel reported in one of Huber's group seminars his spectacular success with the crystallization of the photosynthetic reaction centre from Rhodopseudomonas viridis. Deisenhofer joined the reaction centre project in order to determine the three-dimensional structure of this molecule. Other collaborators were Kunio Miki and Otto Epp. It still took almost three years to work out the complete structure, and two more years to refine the model at 2.3 Å resolution. In 1988 Deisenhofer moved to the University of Texas Southwestern Medical Center at Dallas to become Professor of Biochemistry and Investigator in the Howard Hughes Medical Institute. Deisenhofer is also Regental Professor and Professor of Biochemistry and holds the Virginia and Edward Linthicum Distinguished Chair in Biomolecular Science at the University of Texas Southwestern Medical Center at Dallas. Jointly with Hartmut Michel, he was awarded the Biological Physics Prize of the American Physical Society and the Otto-Bayer-Preis. He is a member of the National Academy of Sciences, the American Association for the Advancement of Science, the German Academy of Natural Scientists Leopoldina, Academia Europaea and the American Crystallographic Association.